Simply pop your name and email address into the box on the right and you’ll be entered into a raffle for free eBook copies of Dark Tidings… book 1 in the ‘ancient magic meets the Internet’ trilogy. What happens when ancient magic meets the internet? One thing is certain, modern life will never be the same again. A thousand years ago, a young thief, Tung, and a disgraced wizard, Madrick, are thrust together in an executioner’s dungeon. In the darkness, Madrick reveals an incredible secret about a legendary spell. The great spell helps them escape their prison cell… and eventually their century. Catapulted into the present day, their lives collide with Michael, a computer hacker who plans to destroy the world’s largest bank. But sinister people are tracking their every move and they will stop at nothing to steal their spell. 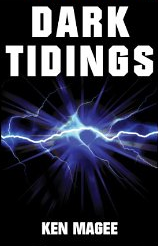 Dark Tidings is book one of the spellbinding Dark Tidings trilogy. 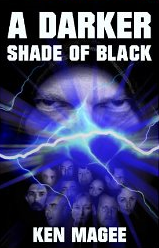 It’s funny and frightening… and it will open you eyes to the dark conspiracy which is going on all around us. This entry was posted in Publications, Uncategorized and tagged books, Fantasy, Humor, Humour, Internet, Magic, series, spells, Wizards on June 19, 2014 by Ken Magee. Ancient magic has infected the Internet… is this the end for civilisation? The ancient magic which transported Tung, a young thief, and Madrick, a has-been wizard, across a millennium has now infected the Internet and civilisation simply can’t handle the consequences. To make matters worse, evil wizards have followed the pair through time. They’re determined to hunt them down, steal the great magic scroll and use its power to destroy our modern way of life. Saving the world just got a whole lot harder. 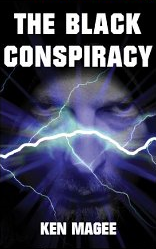 The Black Conspiracy is book two of the spellbinding Dark Tidings trilogy. This entry was posted in Publications and tagged books, Fantasy, Humor, Humour, Internet, Magic, series, spells, Wizards on June 18, 2014 by v42-admin. When two inept time-travellers and an Internet genius mix up a cocktail of ancient magic and too much Tequila, disaster is inevitable. This entry was posted in Publications and tagged books, Fantasy, Humor, Humour, Internet, Magic, series, spells, Wizards on June 17, 2014 by v42-admin. In the darkness, Madrick reveals an incredible secret about a legendary spell. The great spell helps them escape their prison cell… and eventually their century. Catapulted into the present day, their lives collide with Michael, a computer hacker who plans to destroy the world’s largest bank. But sinister people are tracking their every move and they will stop at nothing to steal their spell. This entry was posted in Publications and tagged books, Fantasy, Humor, Humour, Internet, Magic, series, spells, Wizards on April 3, 2014 by v42-admin. I have been writing for more years than I care to remember. Mainly business writing – things like sales proposals, material for marketing collateral and web site content. I love writing. However a few years ago I was given the opportunity to explore the world of fiction writing… and I’ve been learning more and more about the craft ever since. My first novel, Dark Tidings, was published in 2011 and since then I’ve completed and published two more. Of course, I love my books and I think the opening lines create enough interest to make people want to read on… obviously it would be a poor show if they didn’t! But it made me wonder about the best opening lines ever… they say ‘don’t judge a book by its cover’ but maybe it’s OK to judge it by its first lines. The editors of American Book Review selected what they consider the most memorable first lines of novels… 100 Best First Lines of Novels. OK, there are a lot of classics there but none which strike me as the ‘best ever’. I would nevertheless have been very proud of – “The sky above the port was the color of television, tuned to a dead channel.” It’s so good that I now feel I must read the book from which that line comes; William Gibson’s Neuromancer. All in all, I think my favorite to date is from The Stranger by Camus – “My mother died today, or perhaps it was yesterday.” You just have to read on after that. And what about the worst opening lines ever? How about… how about we leave that for another time? This entry was posted in Writer's Block and tagged books, opening lines on April 2, 2014 by Ken Magee.